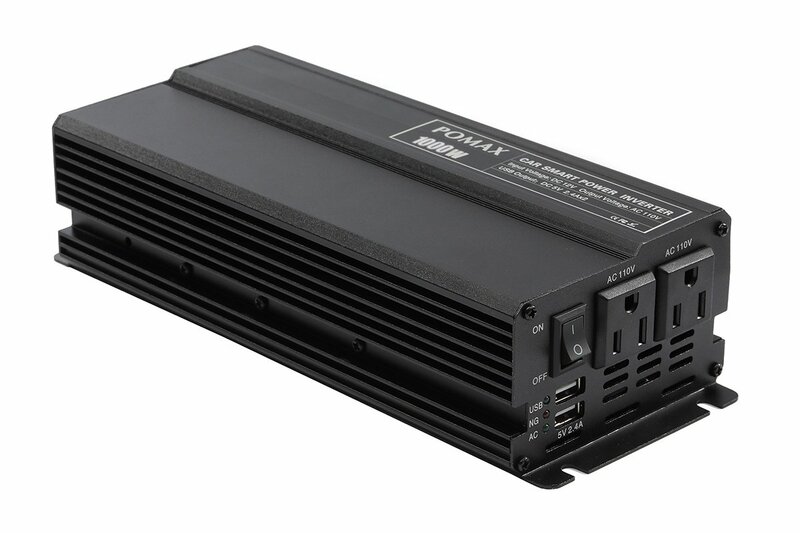 Best Power Inverters for Semi Truck Reviews: Top-5 in April 2019! Do sometimes or always have issues with long hauls where you need to power up some specific home appliance and find you can’t? Well, that’s all got to do with the power supply, and guess what? Your truck is a DC powerhouse, so that’s why you can’t power up AC based appliances. Now, in many cases, some devices, mainly mobile and small electronics, come with converters, but in most cases, such as toaster oven, a hair dryer, and other non-mobile, non-IoT devices require a solid AC source of power and do not connect with USB connectors. This is where a standard power inverter comes in to play. Power inverters convert DC currents into AC current, and I will not go into the science of the mechanism, just state that this technology has been around since Tesla first invented back in the 19th century. (Oh, yeah, for all you youngsters, Tesla is not a car manufacturer, he was an actual human being that lived a century or so ago and is considered one of the fathers of modern electricity). 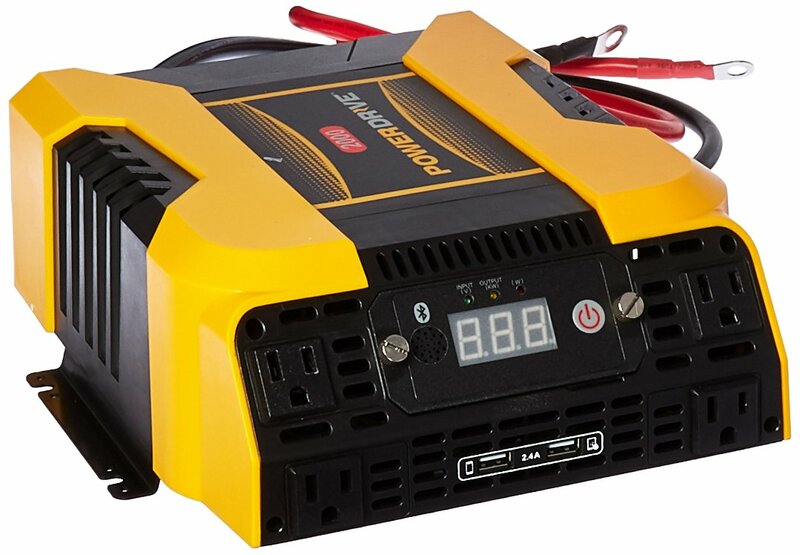 Power inverters work by converting DC to AC, so, first of all, you need a DC source of power, which luckily you have in your vehicle battery. Now comes the tricky part, there are different kinds of inverters that provide different levels of power, and you need to know which battery you have before you buy an inverter. So, either buy a universal one that works along with a wide range of vehicle power sources or buy a bespoke one focused on your specific battery type. The different sizes include 1000, 1500, 2000, 3000 or 5000 watts. Now, some might state you need a 3000-watt inverter, and this is considered to be the mid-range inverter. However, I find that the best inverters tend to be specific for different application requirements, so even a “weak” 1000W inverter will do the trick, and might be safer than an overcharged 5000W unit. Consider the power applications or watt usage your devices have, are you connecting a refrigerator, washing machine, and central a/c unit? I doubt that 1,000W is enough to power a small house in a blackout, so anything more than this is an extravagance, and power for power’s sake is a waste. As such, I prefer to concentrate on standard power usage and concentrate around the 2000W mark, which is more than enough for even a busy campsite, or for powering up a couple of compressors for work. There are also two different inverter methods, one is the modified sine wave, and the other is the pure sine wave inverter. The modified sine wave (MSW) is a cheaper and less powerful model, and are used for powering up every day electronic devices. The pure sine wave (PSW) models are more powerful and compatible with every device you want to connect. In this article I present you with five of the best inverters for your semi-truck applications, and bring you the value for money brands and makes, this means these models are all under 3000W, three are MSW’s, and two are PSW’s. You will do well with all of them, unless you need an inverter to power a small village, in that case, I suggest an inverter above 3000W. The Pomax portable 1000W MSW inverter is a standard 12v dc to 110v ac inverter that gives you 1600W of peak power and 1000W continuous flow. The Pomax is a nifty and neat little inverter that gives you a super-fast exchange rate; it comes with a 110V AC outlet for charging any kind of device including laptops, digital cameras, TV’s, fans, refrigerators, game consoles, and more. There are also 2 x 2.4 USB fast charging ports for mobile and USB devices. 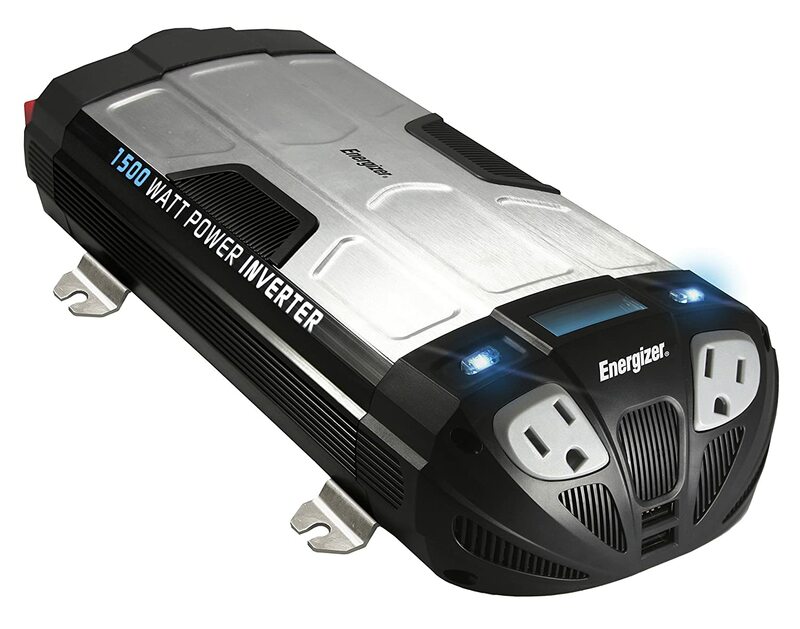 This inverter is designed to connect via the standard 24” lighter connection, which makes this a universal car inverter. This model comes with a built-in surge breaker, so you protect your vehicle as well as your electric devices. It also includes protection from overheating, under and over voltage charging, short-circuiting, overloads, and overcharging. The body is made of an Aluminum Magnesium alloy, so it Is both lightweight and designed for optimized air-cooled performance. This is a classic low watt inverter, so you get 600W of continuous power which is more than enough for powering up extra lighting and even adding the power to a small freezer box or refrigerator. If you want to turn on a LED or LCD TV too, this is perfect. If you need more power and want that extra wattage to power up all the devices you could haul together with your truck; then this is the DC to AC inverter for you. This Samalex PSW inverter connects to your 12V battery and assures safe usage with its built-in overload protection, low battery alarm with automatic shut down and low idle power draw of less than 1 Amp. You can hard wire this model, and use it to support your home in power outages. It comes with a silent temperature-controlled cooling fan and provides low interference wide operating range performance, from 10.7 – 16.5 VDC. This is a powerful PSW inverter that delivers 2000 watts of continuous electricity. You can use this one for long road trips as well as a back up “generator” for your home. 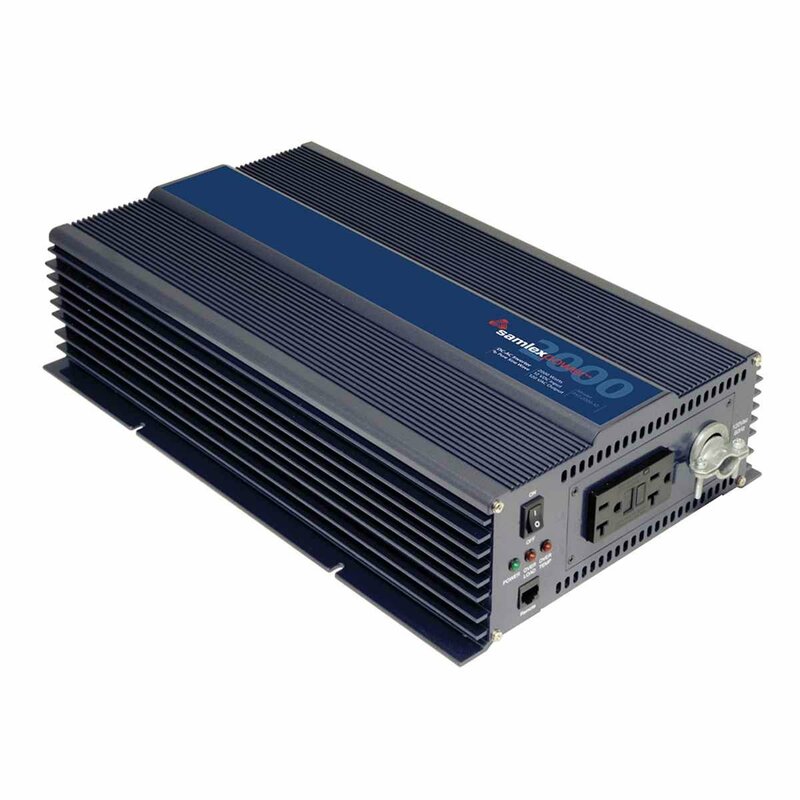 The Energizer #EN1500 is a1500W modified sine inverter is a perfect long haul inverter unit for your road trip requirements. This Energizer unit comes with an LCD display, so you get all the updated information as it happens. This model connects to your vehicles 12vDC port and delivers 120vAC/60Hz with 1500W of continuous power. Since this is an MSW device, you get a 1500W continuous with a 3000W peak performance, delivered through 2 Standard North American AC Outlets, and 2 USB Charging Ports shared 2.1A. The inverter weighs 4.5Lbs and is compact to fit anywhere in the cab. Energizer is a brand name, they specialize in power, and their batteries are a popular global brand. When you buy Energizer, you are buying into a company that gives you the great customer and technical support services, which is always an added bonus. This is the PowerDrive PD2000, 2000 Watt MSW Power Inverter with 4 AC, 2 USB, APP and with Bluetooth® technology. When it comes to IoT compatibility, and using a device that will sit well with all your home appliances, even in the middle of a wasteland, this is the device you want. This compact inverter delivers 2000 watts of continuous AC power. It connects to your vehicles battery port and gives you four 3-prong AC outlets and two USB power ports. You can, of course, add an extension cord to this and get even more connectivity if needed. This model comes with an array of safety features that includes over-temperature and overload protection, and high/low voltage shutoff. The added attraction of this model is its remote control. This is a Bluetooth controlled device, which means you can connect your smartphone to the control center and view the power settings and control the features from a distance. The features of this inverter include a 2000W continuous flow with a 4000 watts surge. The housing includes an ABS PVC composite for both protection and durability. The electronic components are protected via insulation. This model draws from a 12.8vDC source and delivers 115vAC. The USB ports provide 5V /2 (Shared 2400mA)., and the AC Output Frequency is tuned to 58Hz-62Hz. The device comes with a Low Battery Alarm Trigger which activates at 11 ±0.3V DC, and there is a High Battery Shut Down Point that is set at 15.5 ±0.5V. You get a DC/Voice Alarm as well as a mobile notification when connected by Bluetooth. This is a classic MSW inverter, it delivers exceptional performance, and the remote control feature is genius, since you are always pottering around a campsite, or busy with other stuff on a long haul stopover. Having that added remote control is a real relief provider and well worth the investment. The WZRELB 2000W PSW inverter is a professional grade inverter designed to deliver exceptional performance (even with a weird company name). It might sound like a radio station, but the WZRELB is an 8-year-old professional inverter fabricator that delivers a 2000W continuous peak PSW inverter that is good for vehicle and solar panel applications. This model connects to your vehicles 12VDC and converts it to 120vAC with a 60Hz frequency. You get dual US outlets together with an intelligent temperature control cooling fan. The extra safety devices include an earth connection for both the PCB board and the output. This model comes with a digital LED display. Intelligent temperature control cooling fan. Earth connection for both PCB board and output. The WZRELB is a basic unit for basic needs, it’s simple and easy to use, and doesn’t confuse you with frills and bells. 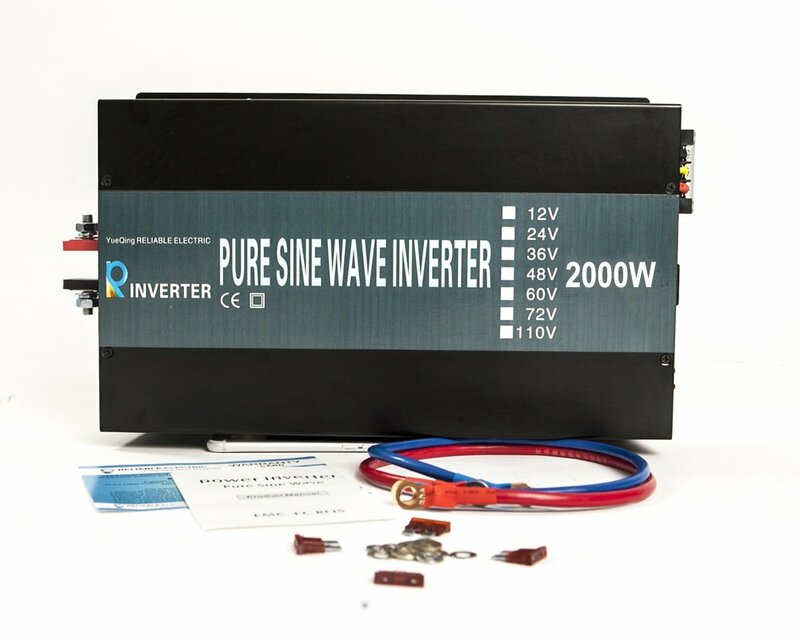 This model is a PnP inverter that provides you with 2000W of continuous power, and it also connects to solar grids if you decide to build one. These five best inverters for semi trucks was not picked by chance, this ere road tested for performance ratings, and they all exceeded the demands required of them. The reliability of performance, the price paid, and the range of applications within the power parameters of each one provided me with the insight to select these five out of hundreds that were tested over weeks of testing.